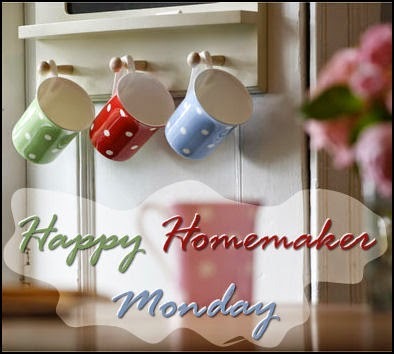 This day very nearly got away from me without doing Happy Homemaker Monday but, it is still Monday:) Thanks to Sandra at Diary of a Stay at Home Mom for hosting Happy Homemaker Monday each week! So, on with the show!!! This day was glorious! Hubby has really whipped the yard and garden into shape and it looks like a park outside my window! Just relaxing at the end of the day and working on this post. I have been thinking a lot about my life lately...what it is; what it could have been; what it could be. I guess it's that 60 benchmark coming up that makes me reflective. Books, magazines, napkins (I am a hoarder of napkins), remotes. Nothing! I am trying to finish up a couple of books I am reading. The wind rustling through the trees outside my open bedroom window. Not good at the menu thing but we did have a delicious (if I do say so myself) pasta salad for dinner today. I might have to make it again this week because it was so good. One load of clothes on the floor waiting to be washed tomorrow; tonight's dishes need to be done. Surprisingly, the dining room table doesn't look too bad this week! Well, that's it for me tonight! I am hoping to be back tomorrow to show you a card or two! I have enough new ones to fill up a whole week!!! Yummy Raspberries! You are an inspiration to many... XXXOOO! Raspberries will take a little longer here. You're keeping busy! I can imagine. I think you had snow till less than a month ago, right?! I cleaned out my closet last week. Took 10 huge bags to the Goodwill! I got rid of all my work clothing. No more suits taking up space. Unfortunately the closets are still quite full. I need to get rid of most of my dress shoes...don't wear them very often anymore. So many clothes in so many sizes! I need to pick a size and get rid of the rest!!! Ooh I love the look of the raspberries. We've have less of strawberries this week and I always feel really decadent eating them. Our strawberry plants are new this year so will have a few but will have to wait till next year for the bounty! Enjoying the raspberries though!